On our next day in Quito we decided to visit the Mitad del Mundo (The Middle of the World) just a quick 50 minute bus ride outside of Quito. Christian, the guy who worked at our hostel, agreed to take us out to see the equatorial monument and show us the area as our “personal tour guide”. This was VERY kind of him, considering he gave up his entire day to tour us around the city for free. In total there were 5 of us and we were all very excited! There are actually two places to see the equator; and if you are a good tourist, one man explained to us, you should see both! The first is the GPS located line; the true center discovered only a short 15 years ago. The second, is only 200 meters away, where the French estimated where the equatorial line SHOULD be a couple hundred years ago. Pretty amazing feat to get it so close if I do say so myself! We started with the GPS located line, and got a tour of the surrounding museum which was wonderful. 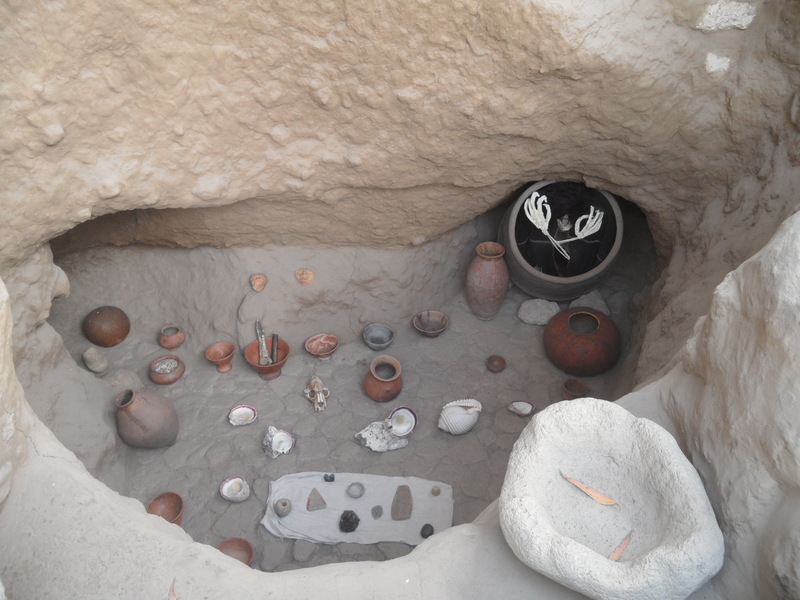 The museum was laid out as if it was a traditional native village. Little bamboo huts, grave sites, and dirt paths were all set up to explore. 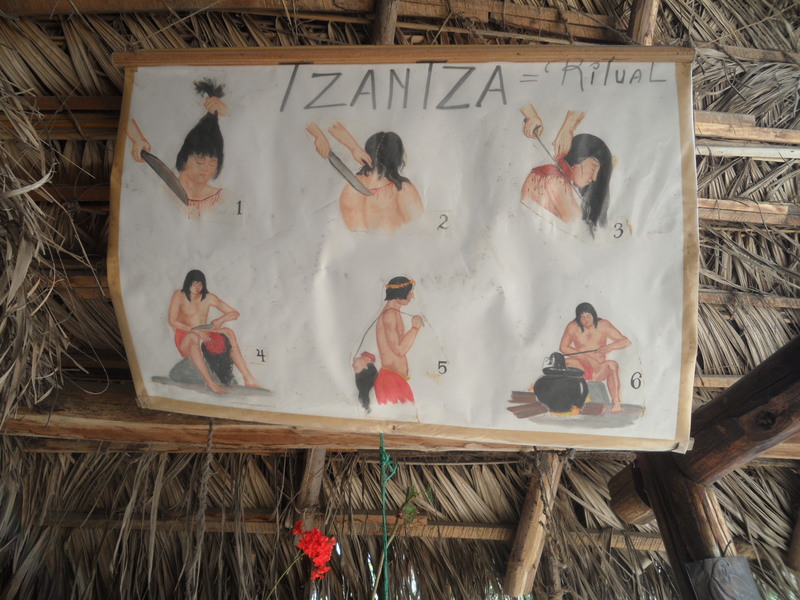 Some of the huts sold hand-made trinkets and woven Ecuadorean blankets, while other huts were more educational. We went into the first and saw all sorts of preserved animals. A giant, 40 ft anaconda skin hung on the wall, tarantulas larger than my spread out hand were in glass boxes, and two massive boa constrictors sat in a tank below. 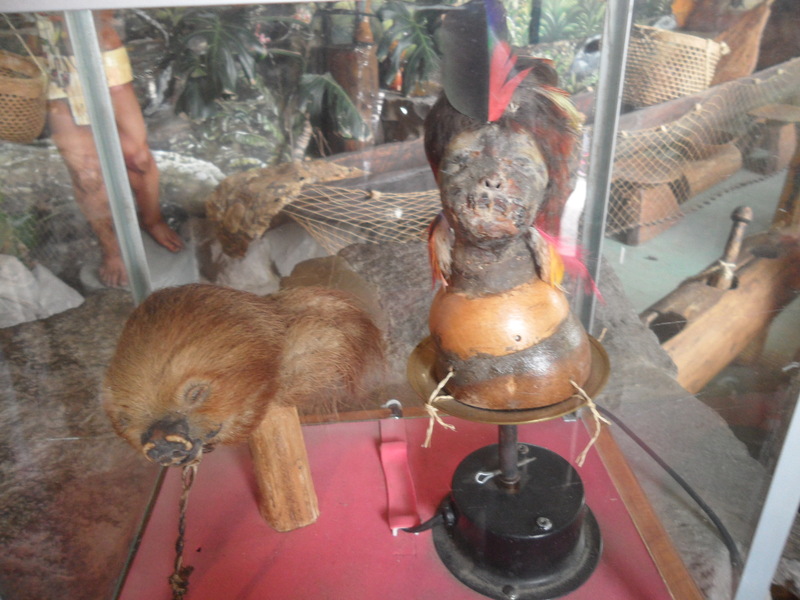 In another display case there was an actual, real life, shrunken head! Apparently only tribes from Ecuador truly practice the shrunken head technique, and they managed to have one on display. It was the head of a child who had died in a tragic accident, the head was smaller than my fist, and all it’s orifices were sewn shut. It was apparently a little over 150 years old, and, to be honest, it was super creepy! It is a tradition with native tribes of Ecuador to shrink the heads of captured enemies, or of people who should be revered in the village. Beside the head, we found a a detailed 12 step process to head shrinking, which I won’t go into, but believe me, it’s gruesome! And if you put your own hand into a fist, that is the size your own head would be if it was shrunk! 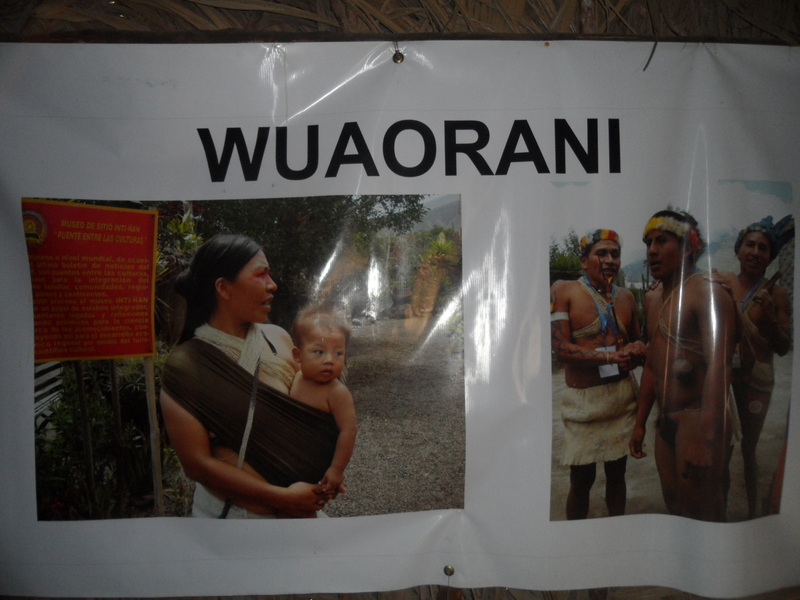 We learned several fun facts about the Wuaorani tribe during the tour. We heard of their traditional hunting techniques (poison dart blowers and double ended spears) and customary dress code (nothing at all). Their burial ceremonies were the most interesting I thought. When a man died, it was expected for him to be buried with all his worldly possessions, that way, he was prepared for the afterlife. However, a man’s wife was also considered his possession; and so, when a man died, his wife was buried alive next to him (that’s love). When a CHIEF died, his wife, his servants, and all his children (apart from the eldest son who would carry on the chiefdom) were buried with him. The bodies were folded up and placed in giant pots to be buried in. In this sense, it is as if a person is being brought both in and out of the mortal world in a dark womb. 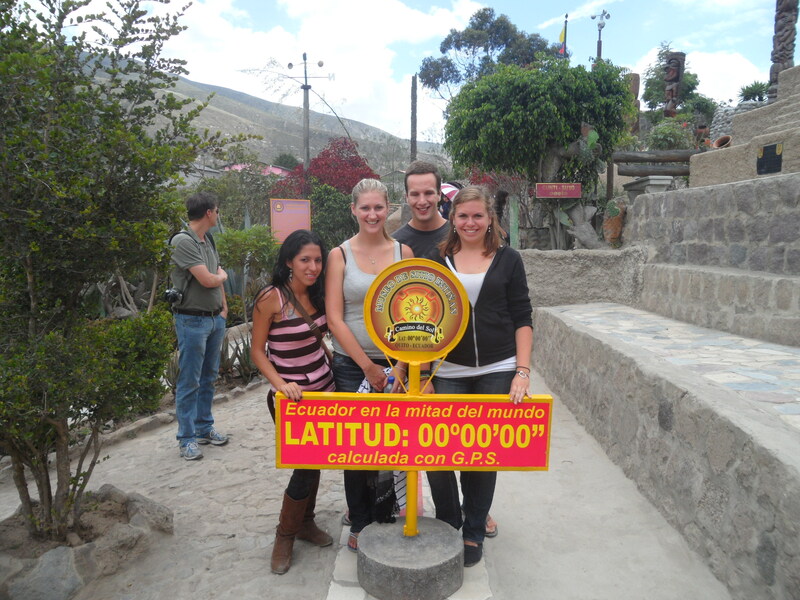 Next we took a look at the equator itself. A big red line was painted along the ground to outline exactly where it ran. I had no idea there would be so many cool things associated with the Equator, and I still have no idea how so many of them work. First off, we all know how excited I was to flush a toilet in the Southern Hemisphere and see if the water really drained in the other direction (which it did). 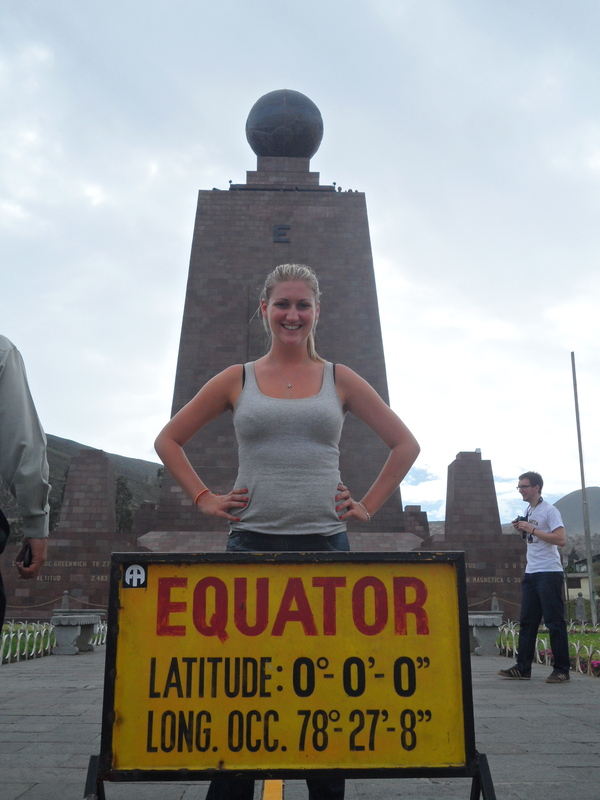 So I was particularly excited to see what happened right AT the equator. From the moment we arrived I was scoping out the banos in hopes to test my theory; however, no need, because the guide did a demonstration for us! 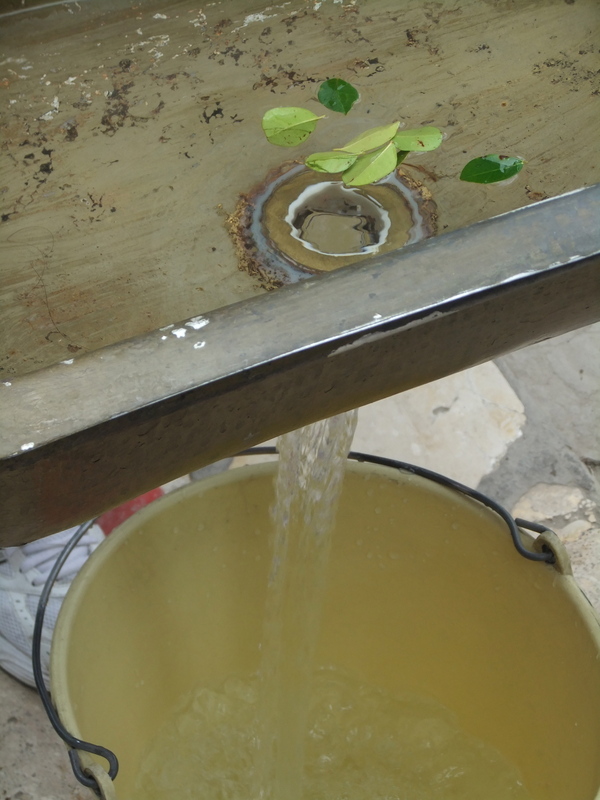 For those who are interested, DIRECTLY over the equator, water runs PERFECTLY downward. It doesn’t spin in either direction at all! Only a step to the South, the water flows clockwise, and a step to the North it spins counter clockwise! I was so excited about this it’s lame. Apparently, the further from the equator you go, the larger the spins become. That is why tornadoes and hurricanes (which will circle clockwise or counterclockwise depending on the hemisphere) never occur along the equator, but are much stronger as they move away from the center of the earth! Another interesting experiment we tried was balancing an egg on its point, on top of a nail, right on the line. 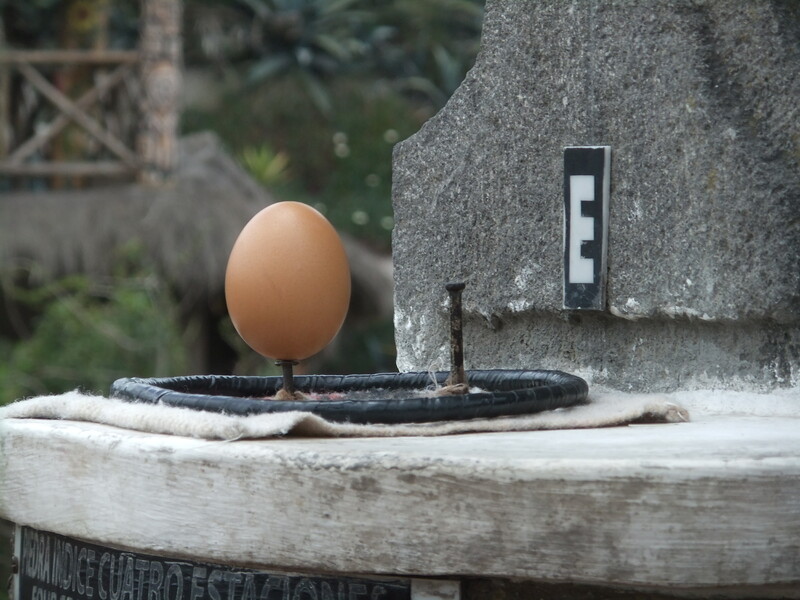 Almost impossible to do so in either hemisphere, balancing an egg on its tip is relatively easy on the equator!! Contrastingly however, if a PERSON closes their eyes and tries to walk a straight line with their arms out (as if for a drunk test) they will immediately fall over. Tried and tested, believe me, it is difficult! Perhaps the most exciting for me was the last test! This entire trip Adam and I have been joking about how weak I am. For all my friends out there who have seen me try to open a water bottle and fail, you can attest to this: I’m not very strong. HOWEVER (and I’m going to brag about this point for the rest of my life, sorry Adam) directly over the equator, I am stronger than Adam!!! Don’t worry; I have unbelievable video proof of this feat to show you all! We tried an experiment where Adam put his hands together, fingers clasped in one giant fist and arms in front of him. I used both hands to try to pull his fists down, while he pushed up toward the sky. Two steps off the equator line I was literally hanging like an idiot off Adam’s outstretched arms in an attempt to pull them down. Fail. We then took one step over to the red line, and did the same thing. I used one arm only, and very easily pulled both his fists down while Adam pushed up with all his strength, veins literally popping out of his neck with the struggle! UNBELIEVABLE! I didn’t even believe it myself! But I watch the video every time I feel insignificant! When we’d finished at the equator it was time for lunch! Christian knew this great little restaurant just a block or two away that sold guinea pig as one of it’s specialties (This was something we’d been searching for since we arrived in Ecuador)! The lady who ran the place opened the restaurant just for us, and started cooking up a storm! We ordered one giant guinea pig between the 5 of us and it was more than enough food! We started with toasted corn with garlic and onion and chilled lima beans (delicious). After, there were the trimmings of a wonderful avocado and tomato salad, boiled potatoes, and some toasted chickpeas. Then came the guinea pig! It was huge, filling an entire platter, and came all put together, looking just like it would have alive, except it had no hair and was a little more still. 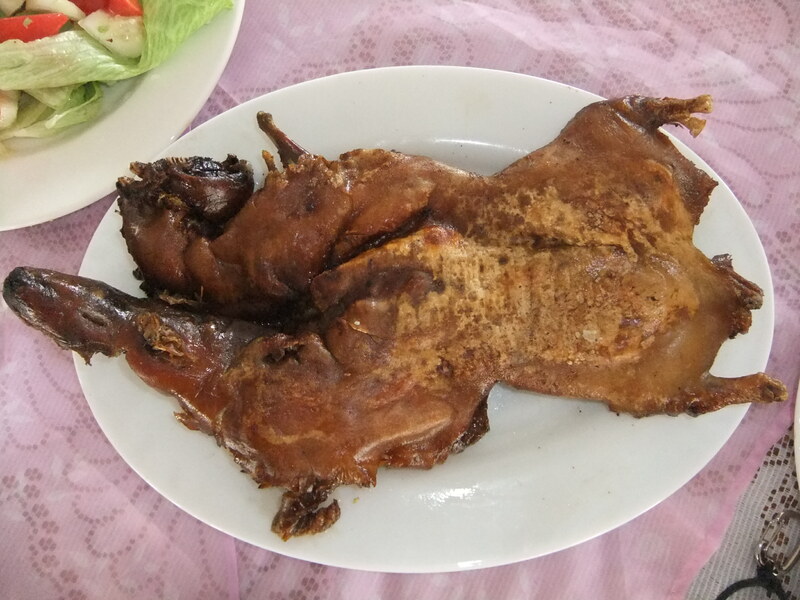 Apparently the traditional way to eat guinea pig, is to just rip the meat apart with your bare hands… So that’s what we did! It was surprisingly very tasty! 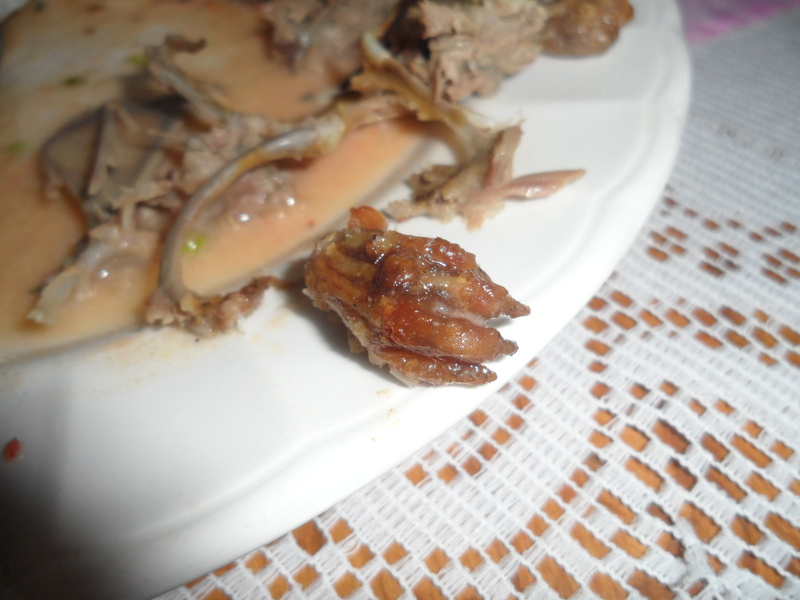 The texture was similar to chicken, but with fattier parts like rabbit meat. The skin was tough but crispy and the taste was unlike any other meat I’ve ever eaten. I don’t even know how to describe it. It wasn’t gamy, it wasn’t the most delicious meat I’ve ever had, but it was tasty!! Trying to eat around its little rib cage proved to be a bit tedious, but we ended up eating almost all of it. We left the head, mostly because looking at the thing’s burnt face and big teeth was a little off-putting. Also, I couldn’t eat the paw, because it was way too life-like and I felt bad as it looked like it was trying to climb off my plate with its tiny claws… Excuse me for being so descriptive. All in all the meal was great, we successfully tried another strange animal in a foreign country and no one had to slurp back a beating heart this time! 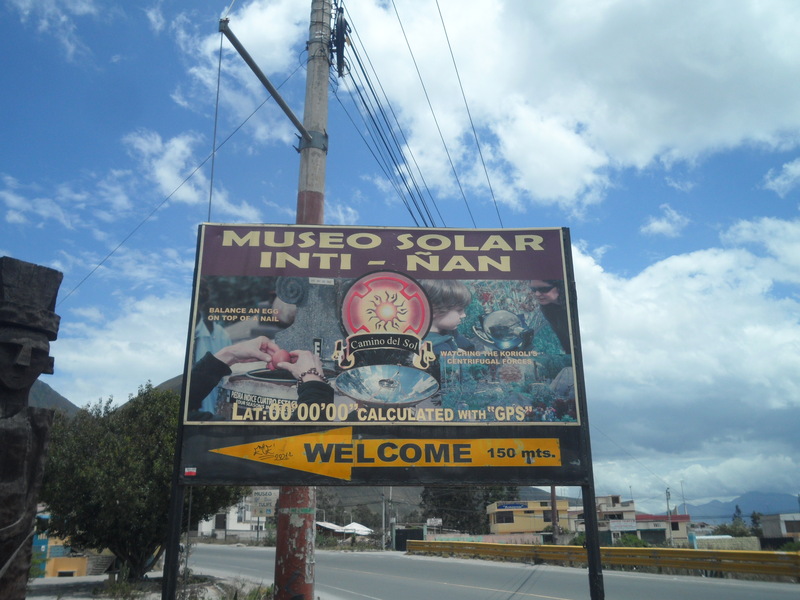 After lunch we went to the second, and original equatorial line. There were a bunch of touristy museums to poke around in, and we checked out some strange insect museum with all sorts of bugs I’d never want to run into in the wild! There is also a massive monument right over the supposed equator line that is a favorite for touristy pictures! We snapped some shots, tried to pet some wandering llamas, and carried on our way! 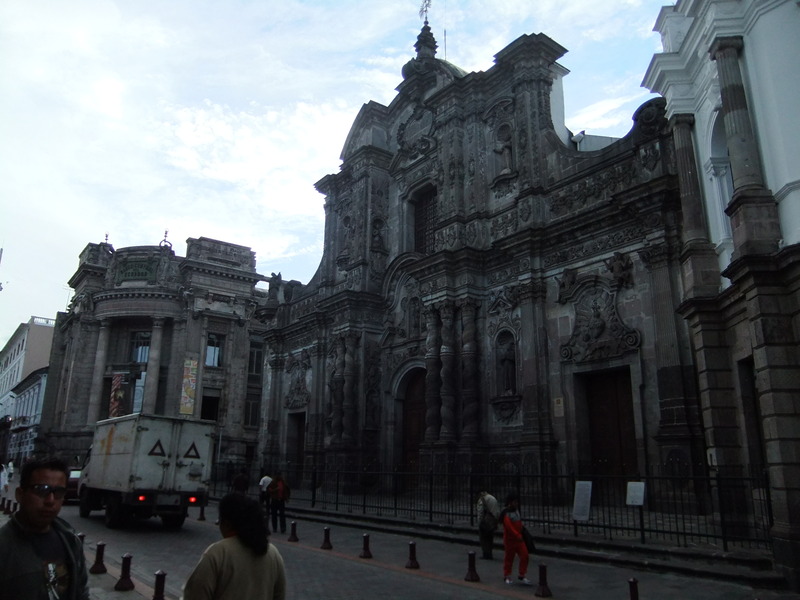 Christian then took us on an amazing, whirlwind tour of Quito’s old town. This was the first time we really explored the city, and it was absolutely breathtaking!! I knew the city was beautiful, but I absolutely did not expect it to be so wonderful. Adam was like a kid in a candy shop photo bombing every plaza, church and statue in the city center. Obviously his favourite city architecturally, and I agree. The city had a very European feel to it. The architecture was intricate, and much of it dated as far back at the mid 18th Century. A couple of the churches took up to 160 years to complete, and on the inside were completely covered in gold adornments of detailed design. 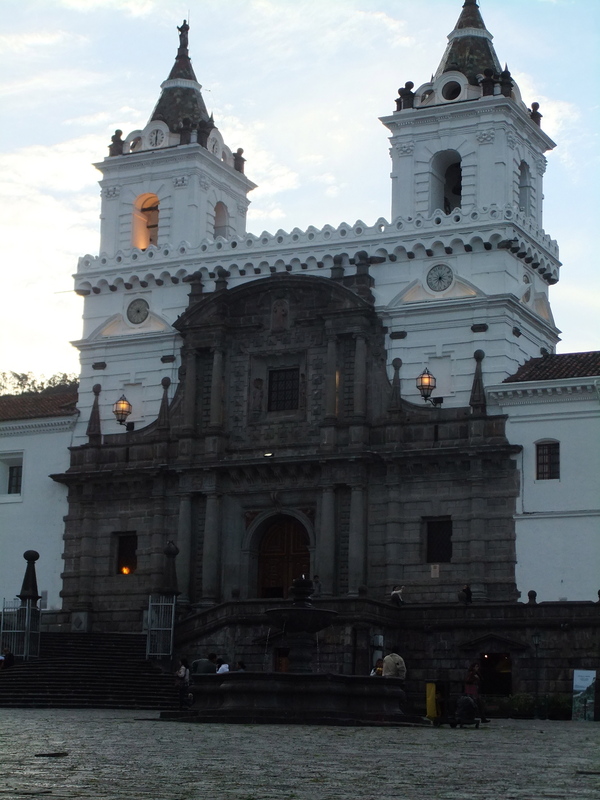 The main church of the city, which took 120 years to complete under the order of Ecuador’s president, was the most impressive by far. It had an almost gothic feel to it with large pointed turrets that stood high above the city. It looked like a building that should sit in the old center of Edinburgh or Bruges. The building was so detailed in it’s design; it was difficult to choose where to focus. 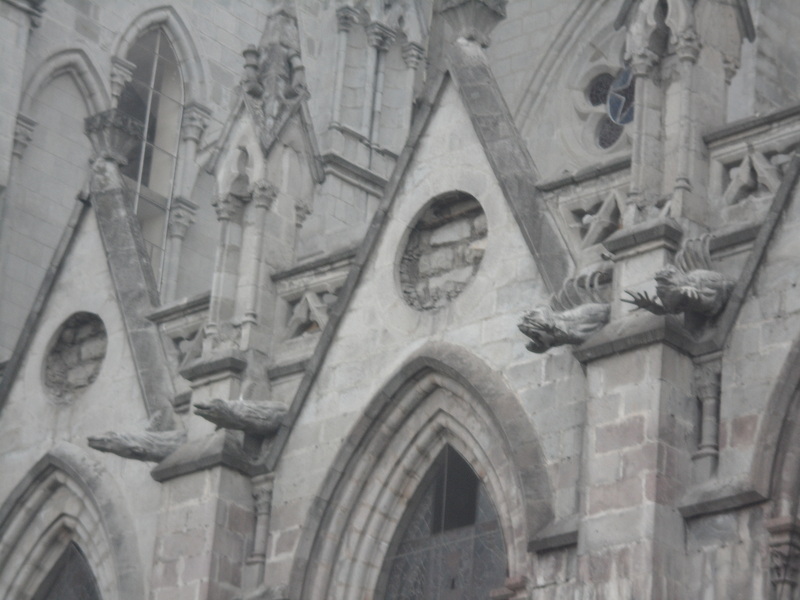 However, what made the building so unique was that, instead of gargoyles as figurines on the side of the building, there were statues of animals that are specifically local to the Galapagos Islands! Big iguanas, sea turtles, birds, the church was covered in these local touches that made it so perfect! Not only were the plazas and the churches so amazing (as like most places here in South America) but the streets themselves were colourful and fun! 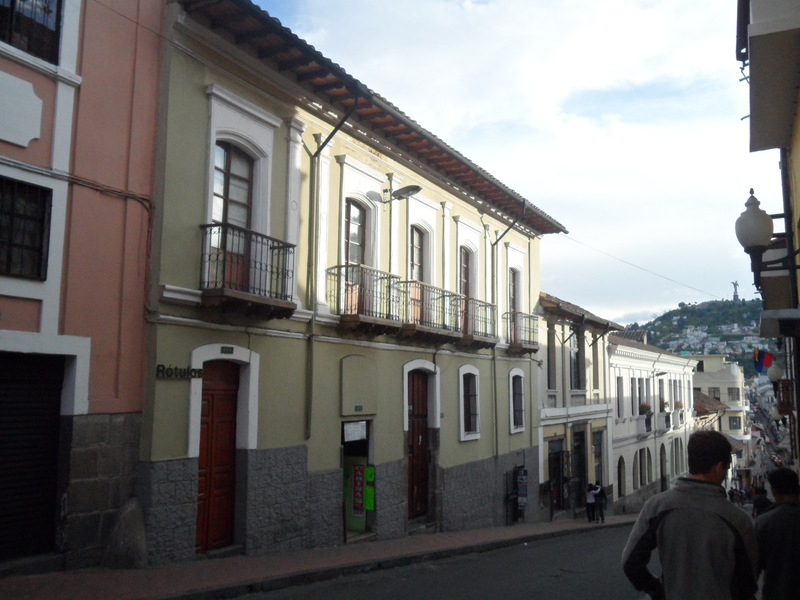 Many of the buildings were perfectly painted in pastel colours with white trim. Almost every home had a second floor balcony with a quaint little gate around an area just a few square feet total. Apparently, years ago, it was common for young men to woo their lady-interests by serenading them from the streets below! The women would then walk out the door, on to the little balcony, and the two could talk. It is a very Shakespearean idea, and the balconies all looked like they were out of a Romeo and Juliet production! How cute! I was a little surprised at how much history and legend each area of the city had. Canada, and in particular the West coast, just doesn’t have the same history. It is newly settled in the big scheme of things, and so churches dating back several hundred years are non-existent. 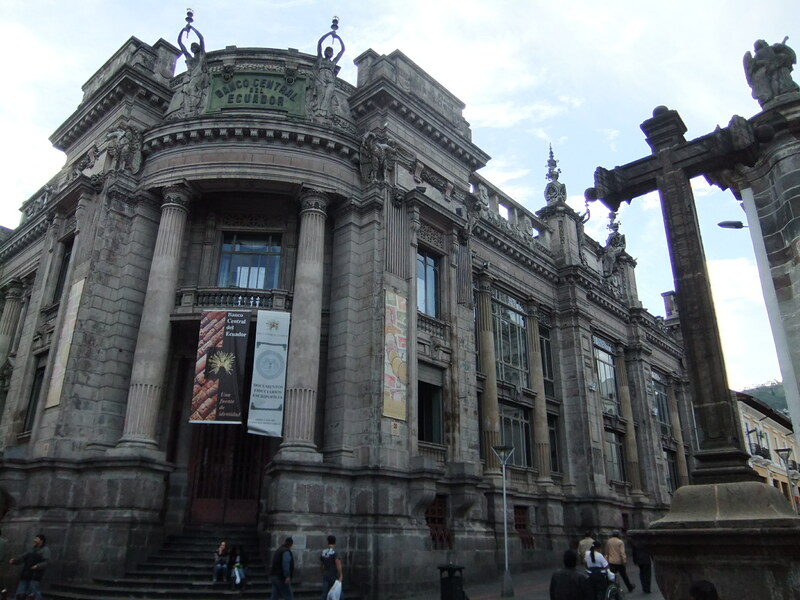 I assumed South America was more recently influenced by European culture as well, yet, cities like Quito have the same amount of history as the best of the European cities!! (and it doesn’t come with the European prices, what a bonus). 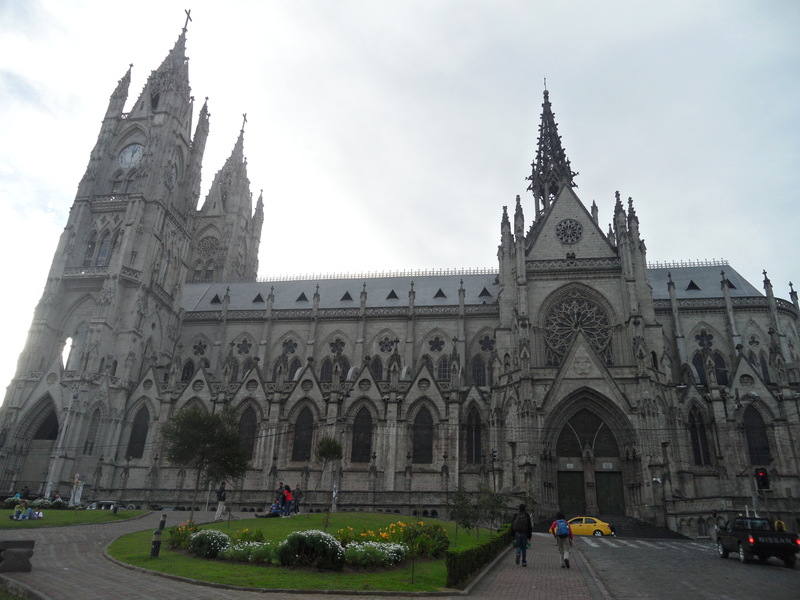 For those of you interested in seeing beautiful, European architecture but can’t afford the Euro, I highly recommend Quito! We ended up back at the hostel around 6:45 and refreshed ourselves from the long day. Then we recruited half our hostel and went out on our own mini pub crawl. We started at a lively Irish pub across the street from our hostel, and ended up at an adorable little salsa club with entirely locals. The place was so small, with a little bar and red brick walls. There were only a handful of people in the place, but we all grabbed partners and got out on the floor to learn salsa! There was a couple dancing when we arrived that was out of this world! Clearly professionals in the dance, they were fascinating to watch! Diane even got a chance to dance with the man and his leading was so perfect she said she felt like the best dancer on earth. And she looked like it too! It definitely makes a difference when at least one person in the pair knows what they’re doing! So after another long night out, we were up early for check out. We decided last minute where we were going to go, and after a hearty breakfast, we set out for a small town called Riobomba a few hours South of Quito! 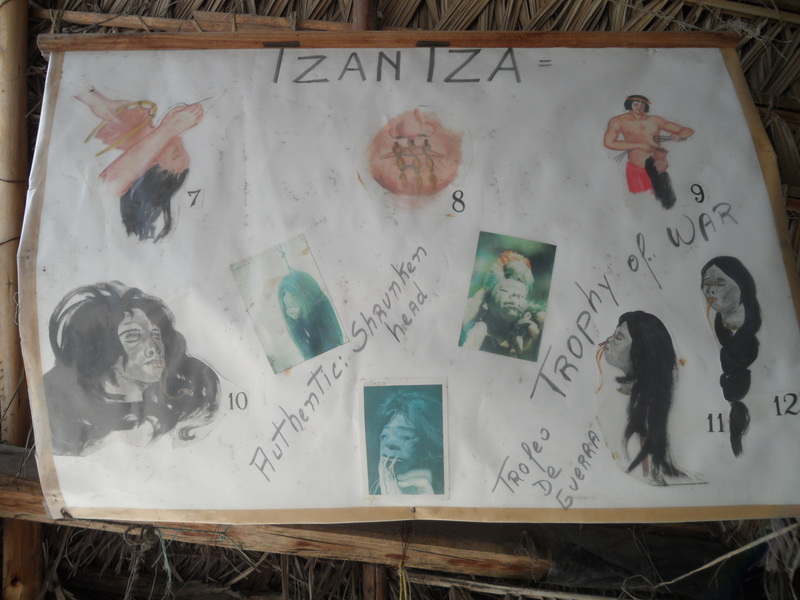 This entry was posted in Ecuador, South America and tagged Balancing an egg, burial ceremonies, churches, Ecuador, Equator, galapagos animals, GPS located line, Guinea Pig, Middle of the World, Mitad Del Mundo, monuments, plazas, Quito, shrunken head, Traditional cuisine, Travel, Wuaorani tribe by hilarylust. Bookmark the permalink.